Physically challenged Nayem Molla, newly elected executive committee member of Jasim Uddin Hall union under Dhaka University Central Students’ Union (DUCSU), have a dream to become vice-president (VP) of the university’s central union and then a member of parliament (MP). Born in 1999 to a poor family in a remote village of Joyrampatti in Aghoiljhara upazila of Barishal district, Nayem is now a second year student of Pali and Buddhist Studies Department at Dhaka University. One of his legs and a shoulder are deformed. It was not easy for Nayem to be a university student as he was born as a disabled baby having different ailments. After his birth, many neighbors in his pastoral village had suggested his parents to kill him. “But my mother did the opposite. She kept me alive through a long struggle using all her vigor, kindness and affection. My childhood had gone visiting doctors and fakirs (religious mendicants). On the 11th day of my life, I was kept in a hospital and it continued through my boyhood,” Nayem told the press in an interview on Wednesday. “My childhood friends and neighbors could not accept me like the other normal children and they used to express pity for me,” Nayem said, adding that these behaviors created a lot of pain during his upbringing in the remote village in Barishal. Defying all hurdles, Nayem, whose father is a rural cook, was sent to school so that none could say him a disabled guy. “My family members – parents, elder brother and younger sister – have been giving me a great support. Especially, my mother struggled a lot for me,” he added. Nayem got admitted in Dhaka University in 2017-18 sessions and he is attached to male dormitory Jasim Uddin Hall of the university. Being inspired by the struggling life of Father of the Nation Bangabandhu Sheikh Mujibur Rahman, Nayem became a worker of Bangladesh Chhatra League (BCL), established in 1948 by the architect of independent Bangladesh before the formation of Awami League. 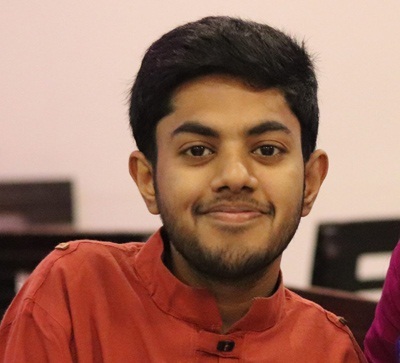 As a nominee of BCL, Nayem who is also a debater, was elected a member of Jasim Uddin Hall Union. “I want to work for the welfare of the common students and realize their rights. I would like to work especially for the physically challenged students whose life is not as easy as the life of the normal students,” he said. Nayem said he wants to form an organization or a platform for the physically changed students across the country. Apart from Nayem, four physically challenged students contested the DUCSU and hall union polls. Of them, three students, nominees of BCL, came out successful by winning the polls. Joshiah Sangma, popularly known as Chibal Sangma, was elected as the first physically challenged member of the DUCSU. Sangma, a student of Sanskrit Department and a member of minority ethnic student group, bagged 12,868 votes in the polls, emerging as the highest vote recipient among the member candidates. Another physically challenged student Abul Hosain was elected to the post of social service affairs secretary at Hazi Muhammad Muhsin hall from the BCL ticket. Besides, differently abled person, Amjad Hossen, a final-year student of Bangla Department contested for the post of a member from the joint panel of leftist student organizations but could not win the race.